Gas absorption chillers, for outdoor installation. Up to to 86% saving in electricity demand. 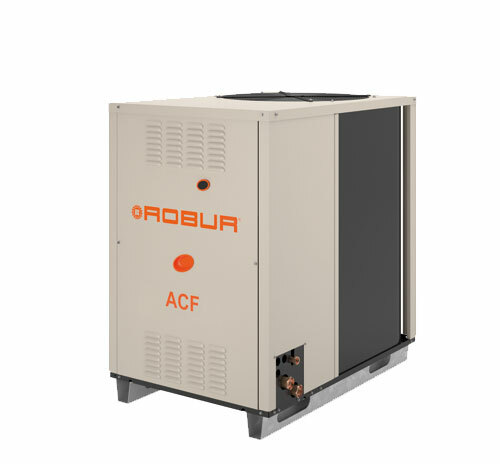 The ACF Series of gas absorption chillers are ideal for cooling in accommodation and commercial, industrial buildings. They are meant for outside installation. Independent and modular, it ensures continuity of service for cooling only as and when needed. RTYF: for heating, DHW production and cooling, using chillers and condensing boilers. Cooling in process applications, for example: in greenhouses for the intensive cultivation of mushrooms; and in rooms used for medium or long-term maturing of cheese. Cooling of controlled temperature rooms throughout the year, for example: data reading rooms, computer rooms, laboratories. Refrigeration of low temperature environments for the food industries, where it is necessary to maintain temperatures inside the room in compliance with health and hygiene regulations. Refrigeration of cold rooms and counters for food preservation. Process refrigeration in systems requiring negative fluid temperatures. Ice storage systems, for the storage of cooling energy during periods of low energy needs. Download the full design manual for all systems. Or use the links below for partial downloads.